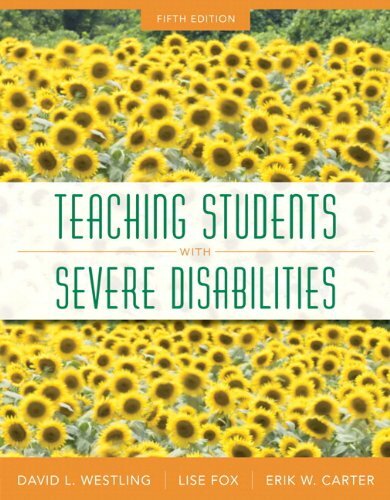 This text presents comprehensive coverage of the major issues pertinent to teaching students with severe disabilities in a form readers can readily understand and apply in their own educational settings. Lauded as a book unparalleled for its level of currency and reality, the authors draw on their own personal experience and an array of professional literature to help make even the most complex research findings on severe disabilities understandable and usable in the real world of education today. They look at both methodology and curriculum, present topics in the order in which a teacher would approach them, and target procedures to learners with specific disabling conditions. The new Fifth Edition of Teaching Students with Severe Disabilities pays thoughtful attention to such topics as how best to support students with severe disabilities to access meaningful opportunities for learning and relationships within inclusive school and community settings; how to ensure students with disabilities have the services and supports needed to participate fully in the life of their school alongside their peers; how to promote successful participation in diverse settings through quality indicators of inclusive education and research-based approaches; and how to make the best use of academic instruction and alternate assessments to evaluate students.